Lord Beaconsfield could trace his ancestry only back to his grandfather of the same name, who arrived in England from Venice in 1759 (though he himself dated his grandfather's arrival 1748). 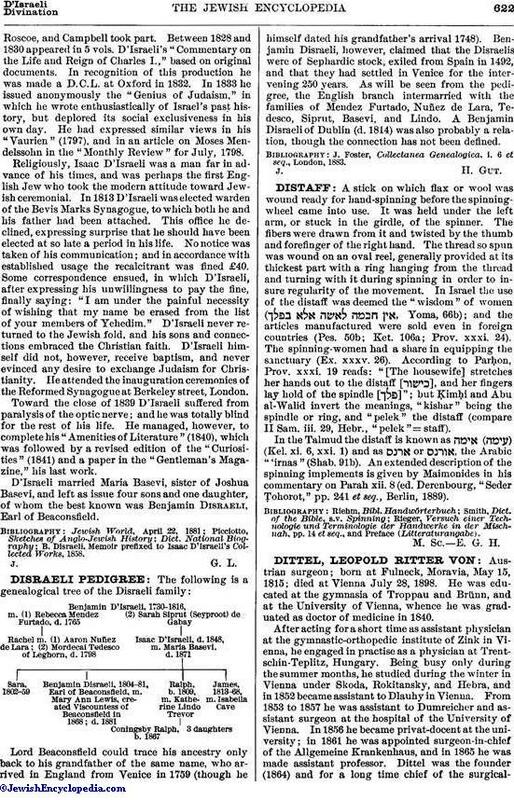 Benjamin Disraeli, however, claimed that the Disraelis were of Sephardic stock, exiled from Spain in 1492, and that they had settled in Venice for the intervening 250 years. 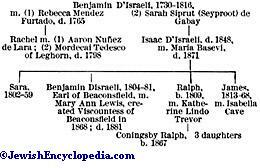 As will be seen from the pedigree, the English branch intermarried with the families of Mendez Furtado, Nuñez de Lara, Tedesco, Siprut, Basevi, and Lindo. A Benjamin Disraeli of Dublin (d. 1814) was also probably a relation, though the connection has not been defined. J. Foster, Collectanca Genealogica, i. 6 et seq., London, 1883.